Milk, Bread, Live Chickens? Check! Imagine if you could pick up some fuzzy, live, laying chicks along with a wheel of Brie and a gallon of milk at your local grocer. Well, for those in the U.K., imagination has morphed into reality. Tesco, the world's third largest retailer and the leading U.K. supermarket chain, is now offering live chickens for sale, along with land allotment rentals. Allotments are basically small spots of land that nearby residents may rent out for a nominal fee and use to grow vegetables and flowers. Imagine if Wal-Mart championed such a cause here at home! Perhaps they'll follow Tesco's lead and realize that the growing interest in food self-sufficiency reflects a shifting lifestyle change for many, not merely a trend in the vein of chia pets or miniature pot-bellied pigs (not that I don't love chias and little pigs). Check out this sneak peak into the exquisitely busy life of a honeybee hive. Absolutely stunning, and absolutely vital, marvels of nature. I would seriously recommend watching the video in its entire, extended glory here. I'm still coming down from my vacation high. First time I've gone anywhere in almost a year. A FULL YEAR, FOLKS! Can you say cabin fever? Highlights of the family vacay included: an hour-long facial, mastering the pina colada, and thinking my younger brother said "cheesy pants." Today is my stepmother's 60th birthday. To celebrate the occasion, my Pop rented a house on the Atlantic Ocean in Florida, just south of St. Augustine. Beth wasn't too keen on my imminent departure, as evidenced above. Moving the suitcase didn't work either, as Cleo had the same idea. We did make it out, though, and have been enjoying sun, surf, sand, and Lazy Rivers (inducing Glenn to sing, repeatedly, this posts' title) since Saturday. My stepmother's friend brought fresh eggs from her 14 hens, which G. deftly transformed into frittatas of a divine nature. Don't be fooled by the seemingly tame presence of a puzzle. This group is full throttle; so much so in fact, that six of them are en route to an airport to engage in a bit of airplane jumping. My stepmother said it was on her "bucket list," so in mere minutes, she and her children, along with several family friends, plan to plunge, willingly, out of a moving aircraft. Not that variety of thrill-seeker, I intend to sip my coffee, nosh on my yogurt, and send them thoughts of successful chutes and sturdy ankles. I plugged numbers 1 through 86 into the widget below, and it provided the winning digits. 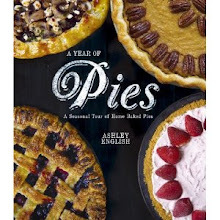 Congrats, Lacey, and thanks to all the rest of you who shared your glorious recollections of summer foods. Don't be discouraged if you didn't win. 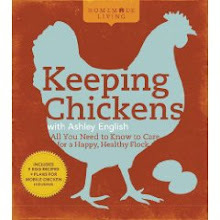 Remember, until publication of the "Raising Chickens" and "Canning & Preserving" (books 1 & 2 in the Homemade Living series) April 2010, I'll be giving away a monthly jar of deliciousness. Check back the first Monday of every month to see what's up for grabs! Small Measure: Play board games. Decidedly low-fi, board games are a great way to entertain groups of varying ages, political persuasions, and degrees of raucousness. Laughs are usually had, brains are usually given a workout, and allegiances are usually forged. Besides, on what other occasion might you witness your step-mother imitating Cosmo Kramer, your Pop humming "Hound Dog" (while gyrating, for, you know, emphasis), and your husband sculpting a television out of clay (Thank you, Cranium!)? This short video on a NYC beekeeper highlights the absolutely vital role these busy bodies perform. Take a gander. And while you're busy gandering about, come view my guest blog today over at What Possessed Me. *Small Measure: Bring your own to-go containers. While I love the occasional Chinese or Mexican take-out, I don't so much love the styrofoam that such cuisine is sometimes packaged in for transit. So, instead, I schlep my own to-go containers in with me. Most restaurants will gladly accommodate the request to pack your victuals in any clean container you provide. Much like keeping canvas shopping bags in the car at all times, I keep metal Sigg containers on hand so that, should a sudden hankering for lomein hit, I'm prepared to cart away my food in a reusable vessel! It's understandable to ask, with all the readily available provisions hugging grocery store shelves 'Why should I can?' I ask, why wouldn't you can? It's easy, fun, healthful, and a great way to use up a whole heap of produce that you just can't quite figure out what to do with. Check out these three new videos my favorite ebony-haired editor put together on why you might want to consider firing up the canner yourself! Wow! Welcome all you newbie commenters and readers! I'm so glad to have you onboard here at Small Measure and look forward to getting to know you all better. In the meantime, come check out some of my fellow friends in Blog Land, whose posts are always informative, instructive, and, in one case, taste-bud tantalizing! To begin, come meet P (that's P, as in "Persephone") over at her always hilarious, often-fuzzy-animal-containing, Brooklyn-based blog whatpossessedme. I found P over a year ago and I can honestly say that my life is richer because of her writings. The consistent wit she proffers could easily give Tina Fey et al a serious run for their money. Currently in between jobs, P and her fiance, "Fauxhawk," are cavorting this week over in the land of elves. Yours truly will be guest blogging in her absence on July 16th. Check it! Maria, herbalist, RN, and mama-extraordinaire, chronicles the trials and triumphs of her own homesteading adventures on a 25-acre mountainside at dirtundermynails (the posts of the "piggy pants" she knit her infant son are worth taking a gander for alone!). For folks living in the Asheville, NC area, you'll want to make a beeline for Jodi's cake shop, Short Street Cakes. Turning out some tasty cupcake morsels daily, Jodi emphasizes the use of local and organic ingredients. She also does weddings, among other events, so keep her in mind should you find yourself in the need for a sweet explosion. Vegan and gluten-free needs can be accommodated. Kelly and Erik chronicle homesteading in the City of Angels over at homegrown evolution. Their freak-of-nature chicken, appropriately dubbed "Chickenzilla," recently produced an egg that could easily feed a family of four. Take a look! Welcome to the first of a series of monthly contests I will be hosting here at Small Measure! 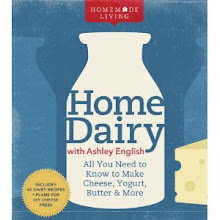 The contest will be posted on the first Monday of each month from now until the release of my book, Homemade Living: Canning & Preserving with Ashley English. Each month one lucky person will win an artfully crafted canned item featured in the book and made by yours truly. For July, in honor of Summer, I’ll be giving away a jar of lip-smacking Peach & Lavender Butter. It’s the perfect blend of nostalgic juicy goodness blended with a touch of floral. How to enter: Simply leave a comment to THIS specific post by telling me your favorite Summer food memory. Your comment must link to your particular blog or web site (and therefore to your contact information) or include your e-mail address. Otherwise, I won’t be able to get in touch with you if you win. Any entries that do not include some way of getting in touch with you will be disqualified. Deadline: Comments must be received by midnight EST July 20th, 2009. Odds of winning will depend upon the number of eligible entries received. 2. Only entry comment per person. How it works: Each comment will be assigned a sequential number. The winning number will be selected from a random number generator, so there’ll be no favorites, simply a game of chance. Keep coming back each month to see the next tasty item up for grabs! And feel free to tell your friends or repost this on your own blog! 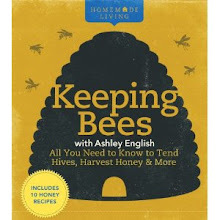 In precisely 1 1/2 hours, I'll be heading out with my beekeeping buddy, Jenny, to pick up two fully established hives. A little bit nervous, a whole lot excited, the buzzing beauties will be a welcome addition to our happy enclave out here in the forest. As soon as they've had time to calm down and settle in, I'll post some photos. And away we go! There's a wonderfully written article (thanks Carol!) about yours truly in today's Asheville Citizen-Times. 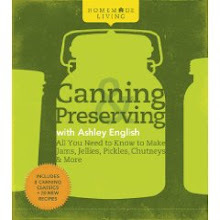 In addition to discussing my "Homemade Living" book series, it also references the canning classes I'll be teaching here in Asheville. Here are descriptions of the classes, along with pertinent info., including time, place, and cost. I'd love to see some of you there! “Jam Session” – July 7 – 6:30 p.m. - 8:00 p.m. Come learn the basics of making homemade jam. Class covers information regarding the water bath canning method, necessary equipment, ingredient selection, and achieving a “set” (what makes jam “jam”). Students will receive hands-on instruction, printed materials, and a jar of homemade jam to take away. Date: July 7, 2009. Time: 6:30 p.m.-8:00 p.m. Location: Earth Fare Community Room, 1856 Hendersonville Rd., Asheville, NC. Cost: $20. Space is limited to 25 students. Please call 210-0100 to reserve your spot. “In A Pickle” – July 14 – 6:30 p.m. - 8:00 p.m. Come learn the basics of making homemade quick pickles. Class covers information regarding the water bath canning method, necessary equipment, ingredient selection, and picking fundamentals. Students will receive hands-on instruction, printed materials, and a jar of homemade pickles to take away. Date: July 14, 2009. Time: 6:30 p.m.-8:00 p.m. Location: Earth Fare Community Room, 1856 Hendersonville Rd. Asheville, NC. Cost: $20. Space is limited to 25 students. Please call 210-0100 to reserve your spot. “Jam Session” – July 11 – 9:30 a.m. – 11:30 a.m. Location: Earth Fare Community Room, Westgate Shopping Center Asheville, NC. Cost: $20. Space is limited to 20 students. Please call 253-7656 to reserve your spot. “In A Pickle” – July 13 – 6:30 p.m. - 8:00 p.m. Location: Earth Fare Community Room, Westgate Shopping Center Asheville, NC. Cost: $20. Space is limited to 20 students. Please call 253-7656 to reserve your spot.